How to Delete Database in phpMyadmin? 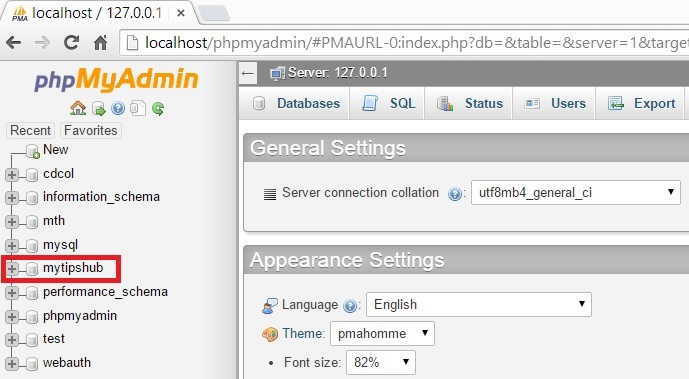 Deleting an entire MySQL database by using phpMyAdmin in Xampp localhost is not a tough job. In this article, you will learn how to delete a database in phpMyAdmin within some simple steps. Here is an easy and step-by-step guide for completing this task. Before proceeding, I recommended, make sure you have created a backup of your DB that you want to delete. Because if accidentally you have done something wrong, you should have a backup to recover it. Before the start, you should know the following checklist points. What is Database and Why It’s Essential for WordPress? The database is the place where all the wordpress settings saved such as comments, users data, files and posts data. So, it is important to always backup your DB. There are many free wordpress backup plugins available which do this job automatically. I recommended you to use any reputed good plugin to make a backup of your wordpress blog. If you are not familiar with this task, please don’t do this otherwise go ahead. If you drop or destroy the DB that runs your site, then it can create some hard time for you. Make sure you have created a backup of DB before deleting it. Save your DB in the safe place. You must know which DB you want to destroy. This process is not recoverable, but you can create restore if you have a backup. Now let’s learn how to delete an entire database in Xampp localhost. First, go to phpMyadmin. At the left side column, there is a list of DB’s that are available or you have created. Choose a database that you want to delete, here I want to delete mytipshub database to guide you. When I click on mytipshub it will show all the existing tables within it. Now click on Operations button located at the top center and then click on Drop the database(DROP). A warning message will shows like this “You are about to destroy a complete database! 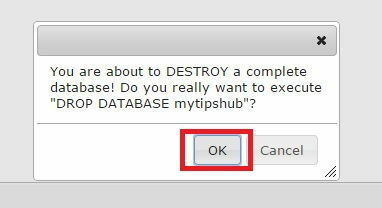 Do you really want to execute “DROP DATABASE mytipshub”? Just click on OK button. Your desired DB just now destroyed. I hope this article helps you to learn “how to delete an entire DB in PHP MySQL” without any hurdle. If you are facing any problem in this task, please feel free to ask me in the comment section. Please subscribe or follow us on social networks for more latest tips.